Thanks a lot! This worked great. It works !! Thanks a ton ! this is nice but the rss icon in the url (firefox) is still there. Why ? Manu’s issue is the same as mine….the RSS icon needs to go away somehow also….any suggestions? 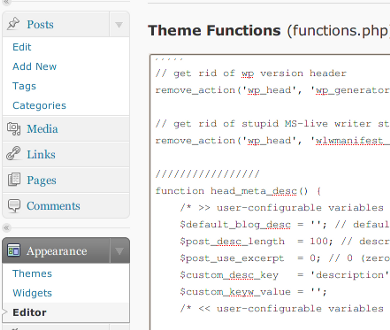 in your header.php remove meta tags related to rss feed and the icon will be removed…. Unfortunately /feed/rss will still work, so this is no solution. create a directory called “feed” in your wordpress root and upload a blank index page (e.g. index.html or index.php etc.). RSS links from WP will display a wonderful white page instead of rss file. Instead of the wp_die, I use wp_redirect(get_option(‘siteurl’)); which just sends them back to the homepage. I also disable rss from the head by removing it from the template altogether. Combined these remove the icon and the actual feed url from working at all. Thanks for a neat, clean solution! I agree, this is a wast of time: it does not work!!!! Many Thanks, because SPAM robots were posting SPAM using my RSS FEEDS ! and adding in root dirrectory (where wp-config.php) file 410.html with your content. Thats all. Fully working mechanism. Warning – Working only with pretty permalink!!! HELP!! I embedded this code and now i only get a bunch of errors and cannot get back to my edit page on wordpress??? Ugh! I tried this and all it did was add a bunch of jibberish text at the top of my page where the normal WordPress header goes and it didn’t remove the RSS feed logo, which is all I wanted to do because I don’t need that. Admittedly, I’m a graphic designer, not a programmer. I can always have my web guy edit it because he has admin access …but it’d be easier if I just knew how it worked :) Thanks! Tnx dude, this worked perfect. Thanks for the information. Problem solved. I edited this code and I can’t even access my wp-admin now…..? Where do I go from now? Even if you’re a webmaster of a small site or use wordpress as a CMS. Why the h* would you want to disable your rss-feed? It allows easily staying in touch with your site/news. If you want your readers to go to your page, use excerpts (the more-tag). Also, most of the proposed workarounds are probably lost after an upgrade. And you really do need wordpress-updates eg. because of security issues. Still, I see no reasonable reason to do so. When I do this my blog disappears! Very strange. That is NOT true, if you do it good, none of your feeds will work! Hello, first of all thanks for the solution, it worked great for me!